Preheat oven to 160°C (320°F). Wash and pat the chicken dry. Place 1 lemon in the cavity of the chicken and tie the legs with kitchen string to secure. 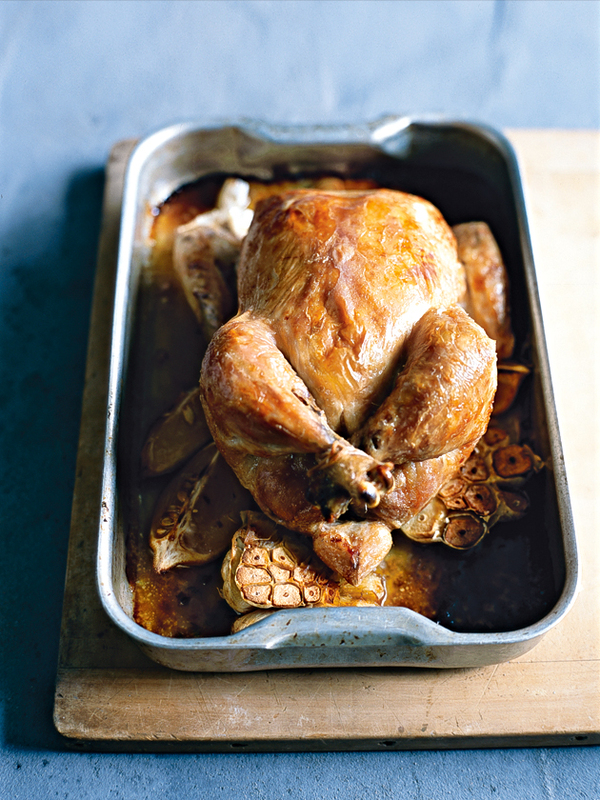 Place the garlic, thyme and remaining lemon in a baking dish and top with the chicken. Brush with olive oil and sprinkle with salt. Pour in the stock and wine and cover with foil. Roast for 2 hours. Remove foil from the chicken, increase the temperature to 200°C (390°F) and roast for a further 25 minutes or until the skin is golden and the juices run clear when tested with a skewer. Serves 4-6.